A blue and violet-petaled Bellender Blue Iris on a black painted textured background. Original oil painting on wood, framed with wood lattice. 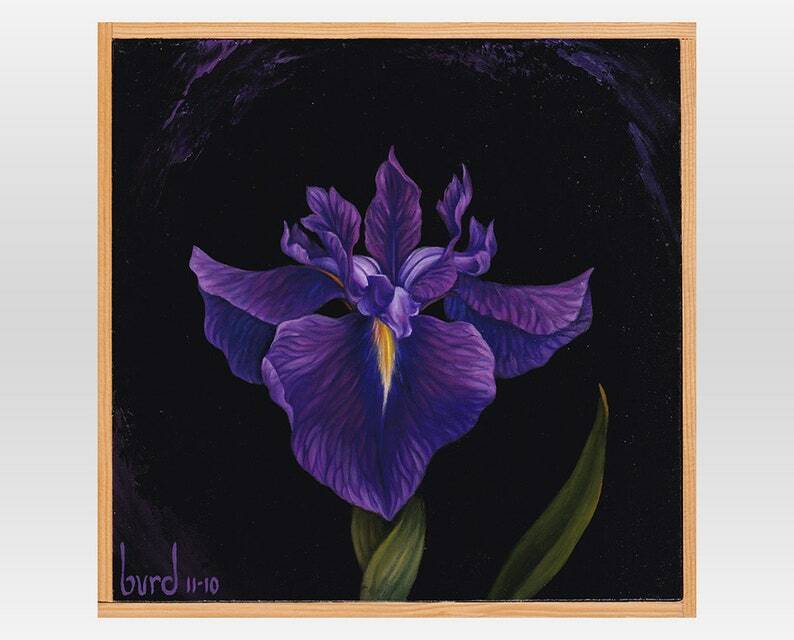 This 8x8 flower series is painted on primed 3/4" cabinet grade plywood and finished with a protective varnish. It is framed with simple natural varnished lattice 1 1/4" deep and is ready to hang or stand upright. This is a one-of-a-kind original piece of artwork, hand titled and signed on the back. Stunning!!! What a talent! The art will not disappoint and is even better than expected. Fast shipping. Highly recommend. Love the depth of the red. Now I have to decide which other's to buy. I gladly accept Visa, MasterCard, American Express, Discover, or regular account payments all through PayPal. This store uses PayPal for payments, and PayPal automatically encrypts your confidential information in transit from your computer to ours using the Secure Sockets Layer protocol (SSL) with an encryption key length of 128-bits. You are not required to have a PayPal account to purchase from this store. Although if you already have a PayPal account you may use it. Payment may also be made through money order or personal check. Once the check has cleared, your item will be shipped promptly. All items are shipped via USPS priority mail. On average, if shipped within the United States, your package will arrive within 2-3 business days once shipped. International orders may take longer. Each item is securely packaged for safe delivery.